In 1950 John Marshall, an anthropologist and film maker, received funding to study one of the migratory bands of Bushmen in Namibia. Known also as the !Kung or San people, the Bushmen are one of the last true hunting and gathering peoples left on the planet. They are what we all were 2,000 generations ago, and what in part we remain today. Marshallâ€™s film, â€œThe Hunters,â€� was, among other triumphs, the first use of color film in ethnographic cinematography and one of the first intimate portraits of the Bushmen. 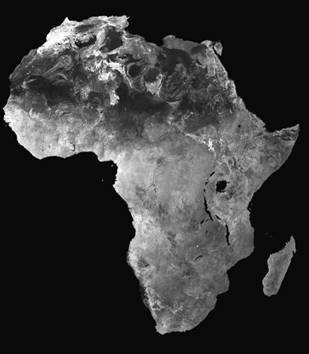 Satellite image of Africa, the birthplace of Homo Sapiens. Credit: Wikimedia Commons. The story tells of a five day hunt by four men from a particular band. Their group, small and mobile, exists on the perpetual margins of starvation. When major hunts are unsuccessful, people die. As we join the film, the men depart in high hopes. Over several days, in fits and starts, they track various animals without much luck. They sneak up on a kudu, get close, and inadvertently spook the animal just as they are about to loose their arrows. They find two porcupines and eat them. Finally, they see a small herd of giraffes and after many complications, manage to lodge a single arrow tipped with poison into one of them. For the next few days we follow them as they track the giraffe over the sere terrain of the Kalahari, nearly losing it in the surrounding hills and dry scrub. Finally, they find the animal in a stand of trees, weakened and abandoned by the rest of the herd. With arrows and spears they battle the still dangerous giraffe, bring it down, butcher it, and begin the journey home. This is the thin shell of the narrative. Inside, there is another story, this one about four men working together, sometimes in counterpoint, to accomplish their objective. Look closely and unflinchingly and you see their individual qualities, their fears and idiosyncrasies, and something older and more timeless being played out on a hard landscape. The story within the story is about four functions in the body politic, each different, each needed, each a set of skills necessary to success. All of them hunt but one among them is especially strong and competitive, able to pick up scents and follow trails when the others are baffled. In these moments, the others cede leadership to his knowledge and prowess. Another is a craftsman and technician, the one who fashions intricate and lethal arrows, the one who repairs spears, belts, and bows. At certain moments, others cede leadership to him. The third is a shaman, a holy man who performs ceremonies and who reminds the others of rituals that must be done if harmony in the world is to be maintained. The last is the bandâ€™s headman, the man who insists on cooperation when the others are squabbling, the one with the furrowed brow who bears the weight of potential failure on his shoulders, the one who urges them to work together until the goal is accomplished. Marshallâ€™s film is a taut, documentary portrait of our ancient and mysterious beginnings and shows us something universal about our humanity. It takes us to the heart of four ways of leading, four alternative approaches to solving problems, four disciplines, and four impulses for human success. One assumes there is not enough to go around and we are duty bound to secure our fair share. Another gives primacy to working as a group and achieving together what cannot be done individually. A third insists on doing what is right and linking everyday actions to higher purposes. The fourth honors our reasoning abilities to achieve practical solutions to pressing problems. All of them together are a prism, a lens that refracts our best intentions into the world. The Rule of Four - The Fellowship of the Ring. Credit: Wikimedia Commons. 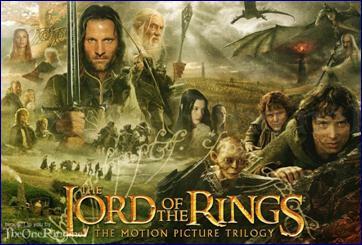 To see this in a literary and cinematic mirror, look no further than J.R. Toilkenâ€™s Lord of the Rings. As the Hobbit Frodo Baggins sets off to destroy the dark powers of the ring, he is guarded on his flanks by a small but potent army of four. There is Legolas, the warrior, a prince of the elven kingdom of Mirkwood. Next to him is Gimli, a leader of the Middle-earth dwarves, famed as metal smiths, tool-makers, and craftsman. There is Aragorn, a human, destined to become the future King of Gondor. And there is Gandalf the wizard, a man whose mystical powers put him in touch with forces both natural and supernatural. Toilken called this strange gathering â€œthe fellowship of the ring.â€� Marshall might have described the four Bushmen in those same terms. Churchill in 1912, First Lord of Admiralty. Credit: Wikimedia Commons. No matter how big or small the organization, no matter if you are leading a country, a company, or a church, conflict is the mortar and pestle of political leadership. Anyone can captain a ship when itâ€™s sitting safe in the harbor. At sea, things get dangerous. Think of Mahatma Gandhi who created a vision of post-colonial India and then helped steer his new countryâ€™s independence through the terrible storms of partition with Pakistan. Think of the real Erin Brockovich doggedly pursuing water polluters in California and adroitly negotiating with her clients, her opponents, and her own law firm. Or ponder Winston Churchill who was a less than average politician in his younger years but became a powerful war leader at the time of Britainâ€™s greatest peril. The best leaders tackle conflict if they canâ€™t steer around it. Sometimes, they create it by raising the hard questions rather than providing the easy answers. They take risks, but not without calculation. They push boundaries, but not recklessly. They use a loose rein most of the time, bring out the best in others, and then get out of the way. Above all, they bring a big heart and a clear mind to resolving conflicts and brokering change.